Roman Sablin wears green and nothing but green. His sneakers, jacket, mobile phone, and even his moped are all green. He hugs everyone, even people he is meeting for the first time. Roman Sablin’s love of the color green began just after his divorce, perhaps because green is the color of hope and that was what Sablin needed at that moment. A trained philologist from a small village near Novosibirsk, Sablin had a well-paid nine-to-five job with a building company, but he was not really satisfied. Open-minded and in search of himself, Roman would leave the office in the evenings to venture into the world of parties and clubs, but this lifestyle failed to satisfy him for long. What he really wanted was to change the world, and he started with art. He called his flat an “art-apartment” where like-minded people, armed with red wine, vodka, and cigarettes, gathered and talked of a better world. Within a few months, the group collected so many empty wine bottles that Roman began to stack the bottles between the double windows. He noticed that in Russia there were no glass recycling bins, and this bothered him. He began to think about a greener way of life. Sablin replaced all the light bulbs in the apartment with energy-efficient ones. His fellow artists were flabbergasted. Not long afterward, they found plastic bags were found hanging in the kitchen labeled with “paper”, “plastic”, and “compost.” Roman had begun to separate the trash. Yet the move was pointless, since all the bags landed in the same trash can behind the building. That was about to change, however. 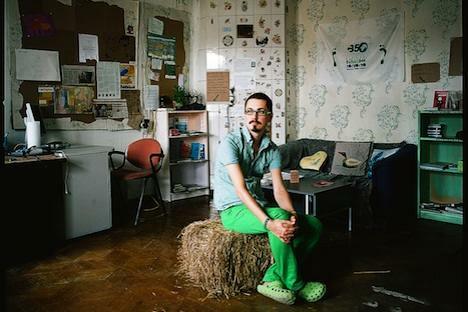 Sablin moved out of the apartment and founded an “eco-loft” in an old building on Pyatnitskaya Street, near the Kremlin. In the summer of 2010, he moved into the spacious five-room apartment with four friends. Decades-old layers of wallpaper were removed and the walls painted with bright, environmentally-friendly paint. In the living room is an old Russian oven plastered with Soviet stickers. On the adjacent wall, printed in large letters, is the web address of the eco-loft, and lying on a table are informational pamphlets for visitors who want to know how to live in an environmentally friendly way in a city that makes it all but impossible. Before the grand opening of the loft, the residents all shaved their heads: no shampoo meant less water consumption. Cloth bags were hung in the hallway in protest against the ubiquitous plastic ones. The loft inhabitants began to separate their garbage, finding out where in Moscow one can deposit plastic, paper, and empty bottles. Roman had found his mission in life. Today he wears trendy square-rimmed glasses – green, of course – and does not drink alcohol or eat meat. He tries very hard to avoid any unnecessary energy consumption and has committed himself to changing the way the citizens of Moscow think. Roman Sablin calls his loft an educational project. Its goal is to show young people that even under difficult circumstances, it is still possible to protect the environment. Every Thursday evening, there are open “eco-seminars” with environmental experts, researchers, and activists – sooner or later, they all find their way to the living room on Pyatnitskaya Street to share their experiences with the public. The room is now too small to hold everyone. Seventy is the maximum, but now the crowds on Thursdays average more than 100. Sablin is now something of a celebrity. All of the Russian TV stations have been to the eco-loft as have the major newspapers and magazines. Recently five young people from Ukraine and Belarus visited the eco-commune to see the experiment with their own eyes. For the thousandth time, Roman gives a tour of the apartment, including the cloth bags and the garbage bins. The visitors greet the straw bale in the living room with enthusiasm, along with the shower in the hallway and the painted walls. But they are particularly taken with Sablin himself. The five young people listen to him, their eyes growing large, as he tells of leaving behind his well-paid job – along with his suit and tie – and trading it all in to devote himself completely to the environment. He earns money on the side as a freelancer, and he no longer needs much. Last May he started a new project: an eco-house in the countryside. This house, located in a village outside of Moscow, has a large garden, solar energy, vegetarian food, yoga and other elements belonging to an ecologically sensitive way of life. Twelve young activists from various fields are planning to live there together. The house can accommodate up to 100 people, and the door is always open. Guests can live in the house for one week while they learn about energy efficiency. Sablin is still looking for sponsors, but he says the prospects are good. And what does his four-year-old son Lyona make of his father’s new life? “Now he’s telling my ex-wife exactly how one separates the trash,” said Roman Sablin with a grin. Roman Sablin was born in 1979 in the Timer Tau settlement in Kemerovo, Western Siberia. He studied in Novosibirsk, and graduated with degrees in philology and literature in 2001. He then left for Moscow where he worked for the building company TechnoNIKOL where he was promoted in 2010 to the head of the PR department. In 2010 Sablin quit his job at TechnoNIKOL and moved into an eco-loft with four flat-mates. At this time he also founded the agency GreenUp, which advises companies on designing eco-friendly offices. Since 2010 Sablin has been the project coordinator of the community portal www.ecowiki.ru. In 2011 he started the “eco-house” project near Moscow.